The Mixed Martial Arts Conditioning Association (MMACA) was developed to bridge the gap between sports conditioning science, MMA training methods, and direct application from the ring, octagon, mat or cage. The training principles are also easily applied to the fitness enthusiast who wants an intense and effective MMA workout. The MMACA also provides you with cutting edge MMA and fitness business and marketing strategies for your financial success. You can live the lifestyle and earn what you are worth. We show you how! The MMA Conditioning Association is the MMA certification division of NESTA (National Exercise & Sports Trainers Association), an international fitness association, established in 1992, and holding the prestigious NCCA National Accreditation for its Personal Fitness Trainer Certification. The MMACA and its staff of educators, exercise physiologists, dietitians, biomechanists, strength coaches, sports psychologists, physical therapists, massage therapists, kinesiologists and business professionals have joined with the world’s top boxers, wrestlers, BJJ players, Muay Thai fighters, American kickboxers, MMA fighters and coaches to bring you the most comprehensive MMA conditioning program ever conceived. It is our mission to develop the world’s best conditioning coaches for all combat sports, develop high performance athletes, reduce training injuries, help develop the MMA industry; bring MMA training principles to the general fitness enthusiast, and to provide MMA fitness and conditioning coaches like you with a secure financial future. In 648 B.C., the Greeks introduced the sport of Pankration into the ancient Olympic Games. The word Pankration is a combination of two Greek words, pan, meaning “all,” and kratos, meaning “powers.” This new word was very fitting for what was a fighting style using all available techniques. Fast forward to 1993 with the formation of the UFC and the awakening of the importance of solid ground fighting skills. In the 16 or so years since the inception of modern MMA, we have learned how essential it is to properly blend some fundamental styles of martial arts (Brazilian Jiu Jitsu, Boxing, Muay Thai, Kickboxing, Wresting, Judo, Sambo and others). During these years of learning and development, there has always been a lack of formalized training and conditioning from a scientific perspective. There have been too many training injuries, fights lost due to poor conditioning, dehydration, lack of flexibility, and a lack of understanding of the “science” of the body. The Mixed Martial Arts Conditioning Association (MMACA) was developed to bridge the gap between sports conditioning science, MMA training methods, and direct application for the ring, octagon or cage. As a “Certified MMA Conditioning Coach” you will be taught the following: Exercise physiology, biomechanics, kinesiology, sports nutrition, sports psychology and conditioning program design (all as it pertains to MMA). 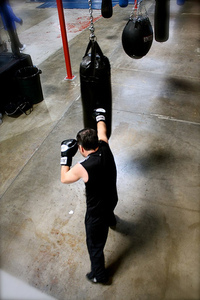 In addition, you will also learn Olympic weightlifting techniques, powerlifting techniques, bodyweight exercises, TRX, and kettlebell training specific to MMA. And, finally, you will learn the most effective and proven sport-specific conditioning drills for Brazilian Jiu Jitsu, Boxing, Muay Thai, Kickboxing, Wrestling, Judo, Sambo, K1 and others. And, if this wasn’t enough, you will also be taught the most effective ways to develop a successfull career as a Certified MMA Conditioning Coach. You will learn free and low-cost marketing to get clients fast. We will also teach you how to run training camps, clinics, and highly profitable one-on-one MMA conditioning programs, and so much more.